Fannie Atcitty has spent her entire life educating Navajo youth so education will be one of her priorities if she is elected vice president of the Navajo Nation in November. The presidential hopeful, Chris Deschene, tapped Atcitty to be his running mate in part because of her background in education and her work providing guidance as chairwoman for the board of regents for Diné College. She was the youngest of 12 children born to Betty and John Lowe who lived in Table Mesa, a small Navajo community about 15 miles from Shiprock. "We were all raised with livestock," she said recently. Her early education took place at the San Juan Boarding School where in the 1950s students were punished for speaking the Navajo language. But despite this, she remembers adapting to the school environment, staying there until she transferred in the eighth grade to the Shiprock public school system, graduating from Shiprock High School. After high school she married Eugene Atcitty after he returned from the Vietnam War. It was a happy union, she said, lasting until her husband died in May 2000 from the effects of Agent Orange. The two went to Eastern New Mexico University in Portales where she took elementary education and her husband took courses in business administration and accounting. When she graduated, she went back to Shiprock where she applied for a job at the Central Consolidated School District and within a month found herself assigned to Newcomb as a reading instructor. She only remained there half a semester and was transferred when an opening came up at the Nataani Nez Elementary School where she taught the third grade. It was during this time that the Atcittys decided to set roots and realizing the problems and length of time it took to get a home-site lease on the reservation, they decided to buy a home in Kirtland, N.M. Which worked out well for her since she applied and was hired as a teacher at the Grace B. Wilson Elementary School in Kirtland, a position she held for the next 18 years. "It was a happy time," she said, adding that she helped at sporting events at the schools and raised two children. Atcitty also took courses in educational leadership at Doane College in Crete, Neb. Billed as a college of 'fearless and bold learning," Doane was another enjoyable experience, she said. She finally retired as a public educator and an assistant principal after 26 years of service. Because of her experience in elementary education, she was called upon by the state of New Mexico to help in assessing their early childhood education programs in math and science and did work for New Mexico Highlands University and the Shiprock branch of Diné College. She also found time to get involved with the Shiprock Chapter, working on its planning committee and helping political campaigns over the years for tribal leaders such as Peter MacDonald Sr., Albert Hale and Joe Shirley Jr., working for them in the Shiprock area. 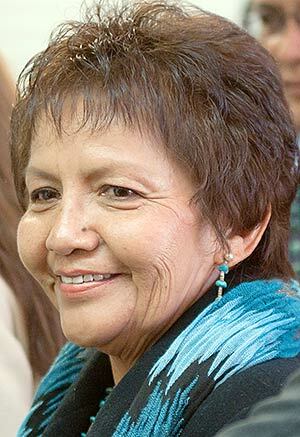 But it as her appointment as a member of the board of regents for Diné College in 2007 that gained her the most recognition among the Navajo public. After getting on the board, she said she began realizing that there were numerous problems in the leadership of the college and she led efforts by the board to make the personnel changes necessary to correct these problems. "I felt that what I was doing were things that needed to be done," she said. When tapped by Deschene to be his running mate, Atcitty said she looked at the challenge as another opportunity to educate people about making the changes needed to improve life on the Navajo Reservation. "It's a matter of how do we move from point A to B and then C." she said.